Wolfram Alpha is a computational knowledge engine that makes money by selling a pro subscription for students and educators that starts at $4.75. It also sells apps for iTunes and Google Play Store starting at $0.99. Further, Wolfram Alpha provides APIs for startups or enterprises beginning at $25 per thousand queries. Wolfram Alpha is a computational engine. In short, when you look for something through Google, the search engine looks through its massive index of web pages to find an answer that fits your query. Therefore, most of the time the search result is based on a web page that already exists, curated by a human. Instead, Wolfram Alpha computes the answer based on raw data it has in its curation pipeline, which gets manipulated by its algorithms to give a proper answer. Let’s say you asked a comparison between Apple vs. Microsoft; rather than look for data and show it. Wolfram Alpha‘s engine will manipulate the raw data it has in its curation pipeline through normalization, validation, crosslinking, analysis, linguistics, expert review and so on. It eventually went to its data cloud to be further manipulated to its computation technology and give back results. How does Wolfram Alpha make money? What are Wolfram Alpha key partners? Google’s primary business model is based on advertising. 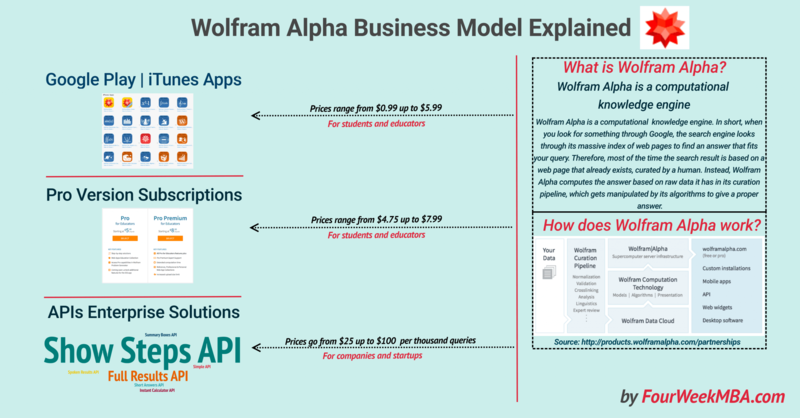 Wolfram Alpha monetizes on products (like Apps and APIs) and subscriptions. That is also why the logic behind Wolfram Alpha and Google is entirely different. Since Google monetizes by advertising, it has to give results quickly as possible. Wolfram Alpha main strength is its ability to provide an answer to complex queries (like comparison among companies’ financials). Wolfram Alpha is a computational knowledge engine that computes answers on the fly by getting the data from its curation pipeline and after manipulating it gives back answers to its users. It is a powerful engine that has a different logic compared to Google. While Google uses its massive index to provide search results, Wolfram Alpha uses its powerful algorithms and its curated data pipeline to find an answer to complex queries. It is true though that the difference between Google and Wolfram Alpha is getting narrower. In fact, Google uses more and more computational power to give back relevant answers to users’ queries.